Dr.Web global update system delivers virus database updates to Dr.Web-protected devices. Dr.Web was first in the world (back in 2000) to start releasing virus database updates at least once an hour — that became the industry standard. Urgent updates are released as soon as the analysis of a new threat is complete. To avoid false positives, an update is tested over a huge number of uninfected files before it is released. Fast updating even with low bandwidth. A special data-compression algorithm is employed to deliver updates as archived files and save traffic. The patch files used to deliver minor additions and fixes for virus database or program modules dramatically reduce the amount of data transferred. Automatic and manual updates—even on computers that are not connected to the Internet. No need to reboot a machine. Automatic virus-database updating ensures that Dr.Web can withstand previously unknown threats immediately after retrieving new virus definitions. The virus databases, as well as key components of the anti-virus—including the drivers, need to be updated so that they can tackle new malware. In such cases a system restart may be necessary. Doctor Web always releases such updates promptly. To save traffic, you can configure Dr.Web to retrieve only virus database updates. However, this option is not recommended because it can enable intruders to bypass the defence even if the virus definitions are up to date. 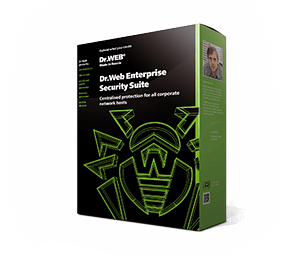 Dr.Web's self-defence effectively resists malicious attempts to disrupt or disable updating. The update technologies update all the stations in the Dr.Web-protected system simultaneously without burdening the local network. With centralised protection, users can update network stations according to a schedule and remotely restart workstations; the protection settings of workstations not under centralised management can be password protected to ensure updates cannot be rejected.